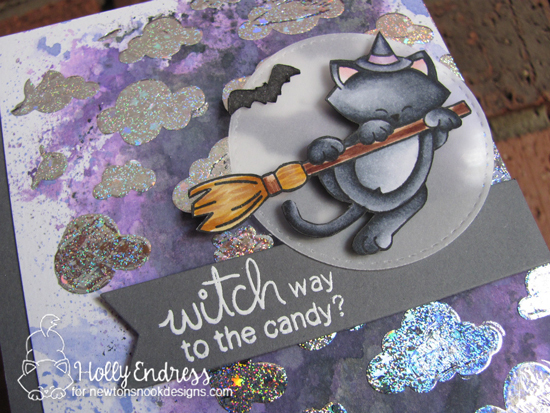 Hollybeary Creations : NND & Therm O Web Inspiration Week!! NND & Therm O Web Inspiration Week!! My first project features Newton's Boo-tiful Night Stamp set, Cloudy Sky Stencil, and a banner from the Frames and Flags die set. I created a background on a piece of watercolor paper using Wilted Violet, Black Soot, and Shaded Lilac Distress Oxide Inks. Once that was dry I trimmed off a 1/4" along the side. 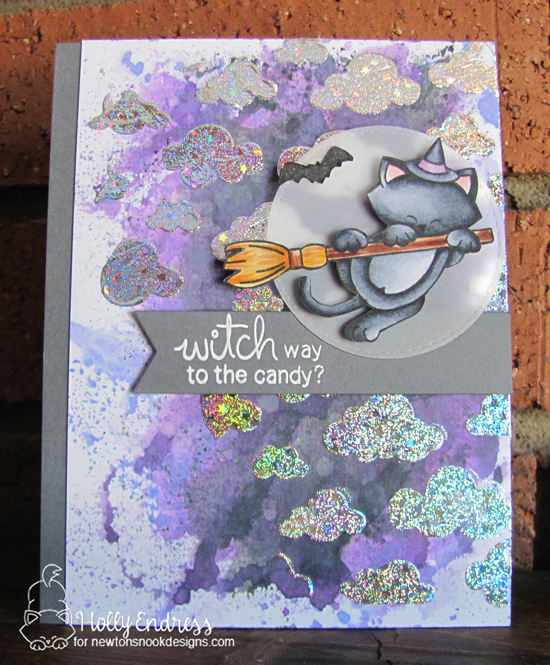 I added some clouds to the background with the Cloudy sky stencil and Therm O Web Deco Foil Transfer Gel. Once the gel was completely dry and clear I added a piece of the Gina K Fancy Foils in Sparkling Silver. I ran the panel through my Minc machine, adding the foil to the clouds. This was a very hard shine to capture on camera, but it's so pretty in person! I adhered the background to a Dark Grey card base flushing it to the right leaving the edge showing. Then I stamped Newton and colored him in with Copics. I die cut a banner from the same Grey cardstock and heat embossed the sentiment. I adhered the banner and added a vellum circle just to the right and adhered Newton in the circle so he would pop a little against the background. 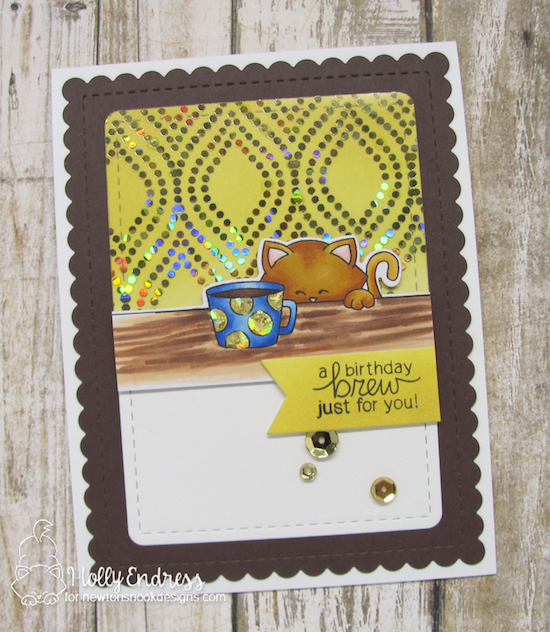 My second card features the new Deco Foil Clear Toner Sheets in the Groovy Pattern. When I saw this design it reminded me of wallpaper. So I thought I'd create a scene with the Newton Loves Coffee set and coordinating dies. I ran the Toner sheet through my Minc Machine (you can use a laminator as well) with the Gina K Designs Fancy Foil in Gold Shattered Glass. I trimmed the piece to fit over my background which I die cut using the Frames and Flags Die set from Newton's Nook. I added some Wild Honey Distress Oxide Ink to the White piece to create a background for the foil piece. I die cut the scallop frame from some Espresso cardstock and adhered it to a White card base and then I added the Focal panel. I stamped and colored Newton with some Copics and die cut him out. Then I before adhering him to the panel I added some more of the Fancy Foil with the Deco Foil adhesive Pen. I added the glue to the circles on the coffee mug and once it was a little tacky I pressed the foil into it and lifted it off. Sometimes when working with smaller images you may get some foil or glue outside the line of the image. You can remove any excess with the Adhesive Remover. I created a banner for the sentiment with the same Distress Oxide ink and then I added a few Gold Sequins to bring in a little more gold. I really love the retro feel of this card. I also used the Therm O Web Purple Tape to hold my dies in place when using my Big Shot and the Easy Tear tape for my adhesive. Here's how to win: Leave comments on the NND & Design Team blog posts using therm-o-web products all week (March 5-9) to enter. One winner will be randomly chosen from blog posts throughout the week so the more posts you leave comments on the better your chances are of winning! You have until Friday, March 9th at midnight CST to comment. The winner will be announced on the NND blog post on Monday, March 12th. There are more amazing projects today over on the Therm O Web blog so pop over there for more inspiration! Oh my goodness!!! I'm totally in love for these adorable and sweet cards!!! Awesome cards! Love that night sky and Newton on his broom! 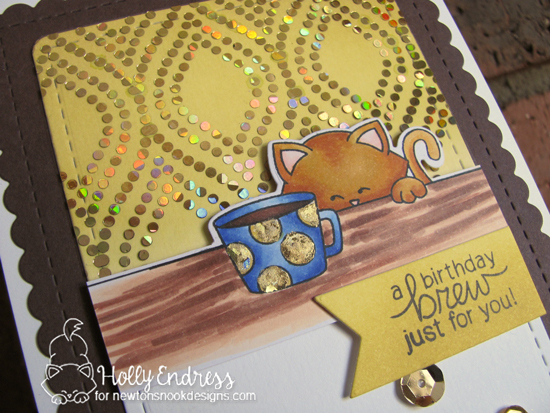 And great background and foil embellishment on the cup for your second card with Newton Loves Coffee! The clouds add so much to the look! I am in love with the foiling!!!! The kitty is so sweet. I really love the top card. The foiled clouds are fab against that gorgeous inked background on the first card. The groovy background is a lovely backdrop for the second card. Your cards are so cute! They really shimmer with that gorgeous foiling! Newton is always adorable! Beautiful card! I love the images and the foil sentiment. are fantastic. The sparkle is wonderful. the glitter on the coffee card is great. The design is vintage and shiny. Wonderful cards!! Love that gold shattered glass foil on the second card and, I agree, that pattern does look like wallpaper. So pretty! Your cards are simply fantastic ! You’ve made such a wonderful background ! Pretty much anybody these days can create a basic HTML web page in Microsoft Word or Publisher and change the title of it to reflect their Branson business. But you must ask yourself: "is this really what I'm looking for"?